In the last several decades, scientists have learned a lot more about the key role fat plays in a healthy diet. While the amount of fat you consume is important, it is the kinds of fat you eat that really matters to health and performance. This shift in thinking is evidenced by the USDA’s MyPlate tool, which explains the difference between types of fats on its newly launched website. Dietary fats, along with protein and carbohydrates, are some of the macronutrients that fuel your body. Stored body fat (called adipose tissue) serves several essential functions in the body: it provides cushion and insulation to internal organs, promotes cell growth, covers the nerves, and moves fat-soluble vitamins (A, D, E, and K) throughout your body. Fat is also the largest reserve of stored energy available for your body to use for fuel. Adults over age 19 should aim to get 20-35 percent of their total calories from fats. Learn how InsideTracker can recommend foods that are rich in healthy fats and help you reach your physical and nutritional goals! Some fats also have a relationship with blood cholesterol, because increasing or decreasing the amount of certain fats in your diet may have an affect on your blood cholesterol levels. 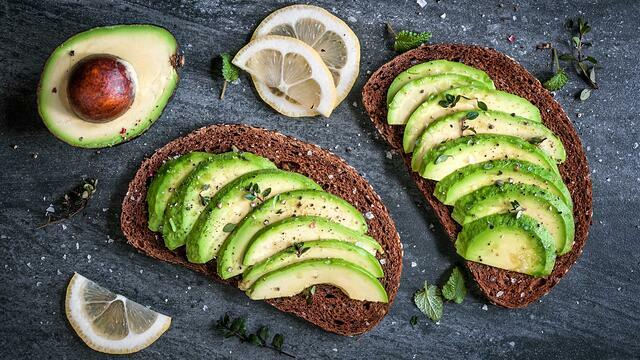 The four major types of fats are monounsaturated, polyunsaturated, saturated and trans fats; read on to learn which ones you should be fueling your body with! Monounsaturated fat (MUFA) is found in a variety of foods such as nuts, olive oil, and avocados. Studies show that eating foods rich in MUFAs improves blood cholesterol levels and may help with insulin levels and blood sugar control, which are reflecting in your fasting blood glucose level (another biomarker measured by InsideTracker). If you’re diabetic or pre-diabetic, controlling blood sugar levels is especially important. Polyunsaturated fat (PUFA) is made up of two major categories (omega-3s and omega-6s) and is found mostly in plant-based foods and oils. Research shows that eating foods rich in polyunsaturated fats improves blood cholesterol levels, and may also help decrease the risk of type 2 diabetes and heart disease. These fats may also protect against irregular heartbeats and help lower blood pressure levels. 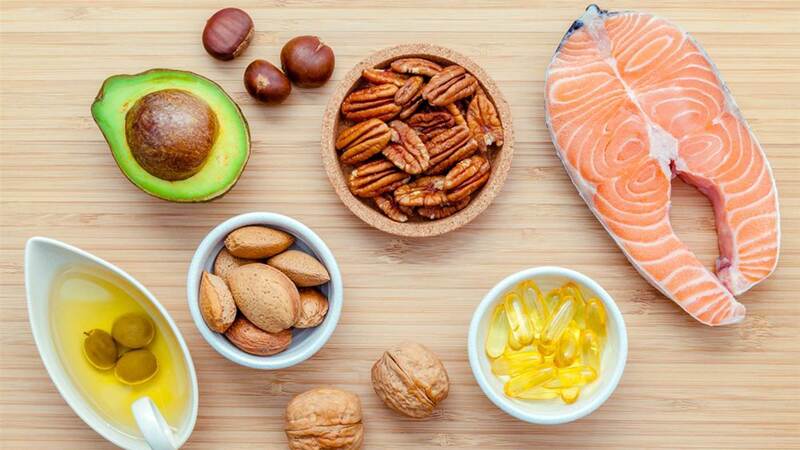 Omega-6 PUFAs are found in vegetable oils such as soybean, corn, and safflower oil, while Omega-3 PUFAs are found mainly in fatty fish like trout, herring, and salmon, but also in walnuts and flaxseed. Omega-3s and Omega-6s are essential oils, meaning that the body can’t make them on its own. They are vital for immune function and cell growth, among other bodily functions. Omega-6s are easier to come by, because vegetable oils are commonly used in household cooking and in processed snack foods. Omega-3s are often harder to obtain through diet alone, and some people may require supplementation. Saturated fat is sometimes referred to as "the solid fat" in your diet, because it is solid at room temperature. It’s best to avoid saturated fat when possible since it is known to raise total blood cholesterol levels and low-density lipoprotein (LDL, aka "the bad cholesterol") levels. Your InsideTracker analysis will measure your levels of both of these biomarkers, and the Nutrition and Food Menu pages can help you choose foods that will help you manage them. Saturated fat is more common in animal-based products such as cheese, high-fat cuts of meat, whole-fat milk and cream, butter, and ice cream, but it is also found in some plant-based sources such as palm and coconut oils. Often times, these fats are added to processed foods, so check the label of things like cookies, pastries, whipped topping and vegetable shortening to be sure you’re not consuming unwanted saturated fat. Trans fats received considerable media attention in recent years when several cities banned their use in restaurants. The FDA now requires foods containing trans fats to be labeled, making them easier for a concerned consumer to avoid. What makes trans fats so dangerous? While they occur naturally in some foods, most trans fats are made during food processing through a process that renders them more stable than naturally occurring oils. This extends the shelf life of the foods they’re used in, but studies show that synthetic trans fat can increase unhealthy LDL cholesterol and lower healthy high-density lipoprotein (HDL) cholesterol, which increases a person’s risk for cardiovascular disease. Most athletes know that carbohydrates are important for them. And that’s true! In fact, you should aim to get about 45-65 percent of your total caloric intake from carbs; they’re your muscles’ preferred energy source during exercise. But less attention is paid to the role of fat in an athlete’s diet, a nutrient that can be equally important. Hard-working muscles require the caloric energy that fat provides (fats contain 9 calories per gram, compared with 4 calories per gram in carbohydrates and protein), but fat, itself, can uniquely benefit athletes. Fat’s calorie density, along with your body’s nearly unlimited storage capacity for fat, makes it your largest reserve of energy. One pound of stored fat provides approximately 3,600 calories of energy! While these calories are less accessible to athletes performing quick, intense efforts like sprinting or weight lifting, they become essential for lower intensity and endurance exercise such as easy cycling and jogging. Fat is a critical source of fuel for endurance exercise; your body actually stores some fat in muscle fibers themselves. Recent studies have shown that regular endurance exercise increases the amount of fat stored within muscle fibers. You can also improve your muscle’s ability to burn fat through training. As you become more fit, fat plays a greater role as an alternate source of fuel and by helping your body conserve carbohydrate stores for when it needs them most. InsideTracker’s Food Menu page can help you ensure that you’re fueling your body with healthy fats that meet your unique dietary preferences and needs. The timing of fat consumption can also be important for athletes to consider. It’s not usually recommended that athletes consume fats immediately before or after a workout since fat is slow to digest and be converted into a usable form of energy. Converting stored body fat into energy also takes a great deal of oxygen, so exercise intensity must decrease for this process to occur. Consume your healthy fats several hours before or after your workout to maximize energy conversion. Remember that a diet that is balanced with carbohydrates, protein, and healthy fats is the best way to fuel your body and help it recover quickly from intense bouts of exercise.